After 33 years, the Science Fiction magazine giant Starlog will cease publication, moving from a print format to an online one due to the stresses of the economy. However, in the announcement of this change, the magazine made sure to stress that the end of the print version would be only temporary, implying that it would return to a hard-copy format in the future. 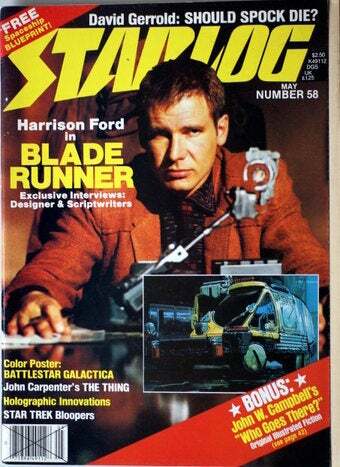 It is also at this time that we announce the temporary cessation of the current run of STARLOG as a print magazine. After 33 years, and considering the present state of the economy, we feel its time for a major revamp and will be temporarily discontinuing publication while the model and redesign of the magazine are contemplated and executed. Kerry O'Quinn and Norman Jacobs started the magazine in 1976, with Quinn serving as the first editor and Jacobs working the business end of things. During the early stages, the pair wanted to talk exclusively about a new television show, Star Trek, and sought to release never-before-seen pictures and interviews. But, because of rising costs and legal issues, they began to explore other aspects of the science fiction genre to cover. Their first issue, published in August 1976, sold out, and with such results, the publishers decieded to take the magazine to a new issue ever six weeks, up from the quarterly format that they had first envisioned. Throughout its long history, the magazine covered up and coming science fiction projects, and has been the longest running magazine of its kind. In March of last year, the parent company for Starlog, Creative Media, filed for bankruptcy and Starlog was sold to The Brooklyn Company Inc. It seems that financial problems have followed the magazine, and are in part responsible for the move to a less-expensive online format. The other reason for this move likely comes from the growing use of the internet when it comes to news. Anyone who's paid attention to the world today will tell you that the past couple of years haven't been the best for print newspapers, which face declining readership as readers go online to get news faster, and for free. Indeed, the science fiction world has had bigger problems when it comes to print magazines, with top perioticals such as Asimovs, Analog and others noting yearly declines in readership. Yet, to quote Douglas Adams, "Don't Panic." The announcement stressed that this was a temporary absence from the newstands, and while there is certainly the chance that we'll never again see new issues on the newstand, we're hoping the Starlog crew will be working very hard to make it so.